My opinion of jumping puzzles is likely opposite of most people who have played games like Guild Wars 2 or Star Wars: The Old Republic: I actually kind of like them. Sure, some of them are extremely frustrating, and I admit that I really am not very good at them. But they are fun, and they make MMOs more interesting than a straight combat simulator. Sums up the GW2 JP’s pretty well. I find people either love ’em or hate ’em. I came into the game hating platforming with a passion, esp. after datacron hunting in SWTOR. However, GW2 is more responsive, so with a little practice, I’ve come to adore them, even the timed ones. Darthbawl Siphaed cromahr Ryuen No, I don’t have to get all the achievements. Shinies, however, are another story! Jumping puzzles are a content filter for me. If I see one, I filter out that content and go do something else. mbbrazen paragonlostinspace I can’t wait to be a grandparent. I tell the kids of course that I want them to wait until they’re done with college and are at a place in their lives where they’re in a solid relationship and are financially sound, but the wannabe grandparent in me really can’t wait! heh. 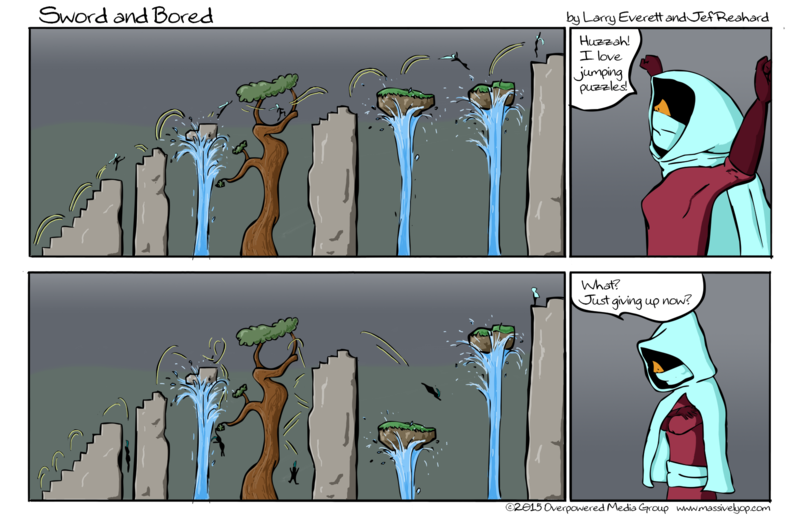 I quite enjoy platforming games, but all the jumping puzzles I have seen in MMOs err on the side of frustration, because the movement animations and precision are lacking for that kind of thing. I can do them, I just don’t find them particularly enjoyable. I would rather exploration style puzzles unless the game has amazing parkour style responsive movement. It’s not the fact that there are basic cross gameplay elements in MMO’s that bother me, it’s the execution of said elements that often feels lacking. Now maybe GW2 has some good ones that are fun but generally speaking in the MMO genre they are lacking in execution in my opinion and badly executed platform gameplay can be an exercise in frustration.